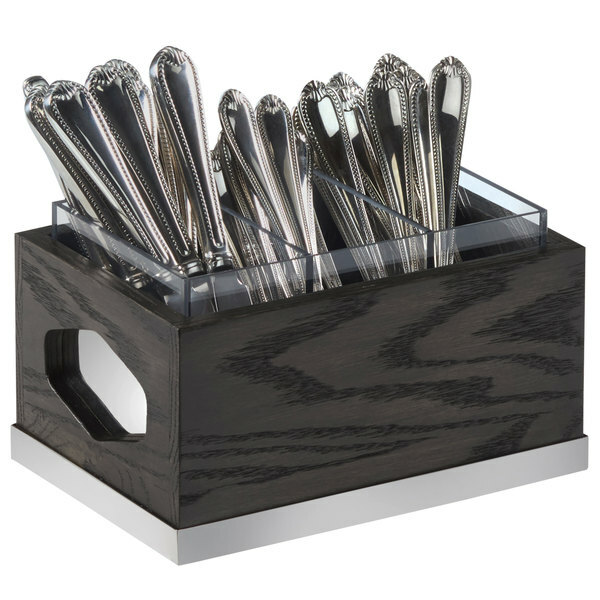 Cal-Mil 3811-87 Cinderwood Three Compartment Flatware Organizer - 9 1/2" x 6 3/4" x 4 3/4"
Keep your knives, spoons, and forks separated for easy identification and selection with this Cal-Mil 3811-87 Cinderwood flatware organizer. Divided into 3 equally-sized compartments, this organizer provides adequate room for a variety of flatware. Unlike covered flatware bins, this open top organizer makes identifying flatware options easy while providing a simple, chic presentation. Plus, its removable plastic insert makes cleaning a breeze. The open design also notifies staff when refills are necessary, promising your guests never run out of the necessary flatware. Thanks to this organizer's durable stained oak base, this organizer gives a modern rustic appeal to any restaurant, catered event, cafe, or hotel! Use it by itself, or add it to the rest of Cal-Mil's Cinderwood line (sold separately) to create a modern look to your coffee shop or hotel!